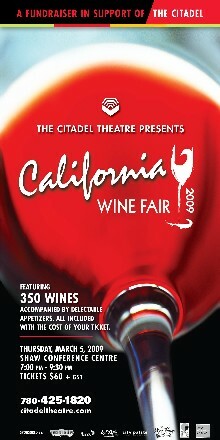 The annual 2009 California Wine Fair in support of the Citadel Theatre is fast upon us. Please join us again at the Shaw Conference Centre on Thursday, March 5, 2009 from 7pm to 9:30pm. This is a grand tasting featuring over 350 wines from one hundred wineries in the California winemaking region. Paired with delectable appetizers, this is a must for any California wine lover. As usual, a silent auction will be held highlighted by a two night stay at the Fairmont San Francisco and a tour and dinner at Beringer Winery. Tickets: at deVine’s or phone 780-425-1820 or online here. As per other years, deVine will be hosting at the store a California wine tasting as a warm-up precursor to this year’s California Wine Fair at the Shaw Conference Centre in support of the Citadel Theatre slated for Thursday, March 5, 2009. We will be tasting over seventy wines this coming Saturday, February 21 from 11am to 5pm, all of them different than what will be served at the main event – it is a great way to wet your appetite for the main event. The $10 entry fee will be donated to the Zebra Society of Edmonton in support of abused children in our city. This is a drop-in stand-up event, but if you want to pre-register, you can do so online. Valentine’s Day is fast approaching next weekend. If you’re planning that stay at home special evening, here are some interesting wines to share with that someone special in your life from reception wine to white to red to dessert wines, and in all price ranges. If you have more specific needs, please feel free to drop in the store and one of us will gladly help you pick the right wines for this special occasion. ‘Bubbly’ Champagne – a must and French Champagne is the ultimate! A dozen roses and a rosé make a great pair! The de Sousa is part of the wave that is the Grower’s Champagne, growers that use to sell their grapes to the higher profile producers – well now, they are making a name for themselves. The Bollinger is the Champagne that James Bond drinks, and this is this prodigious house’s first ever non-vintage Rosé. Finally, the famous Dom Perignon is for those that want the best!